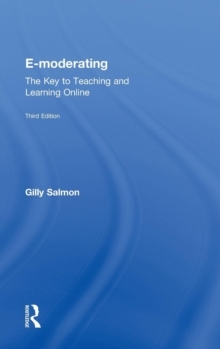 Professor Gilly Salmon has achieved continuity and illumination of the seminal five stage model, together with new research-based developments, in her much-awaited third edition of E-Moderating - the most quoted and successful guide for e-learning practitioners. Never content to offer superficial revisions or simple "solutions" against the pace of technological advances, the expanding interest and requirements for online learning, and the changes they have wrought, E-Moderating, Third Edition offers a richness of applied topics that will directly impact learners and teachers of all kinds. The book is carefully crafted and supported with evidence, examples, and resources for practical guidelines, making it potentially transformational for all practitioners. E-Moderating, Third Edition includes:updates of literature, key terms, case studies and projectsfresh examples of the use of the five stage model around the world, at different levels of education and across disciplinesguidelines for moderating for podcasting and virtual worldsillustrations from the latest All Things in Moderation development programmes (www.atimod.com)new resources for practitionersa companion website: www.e-moderating.com.